I my F4i keeps blowing starter relays, 2 so far. Not sure the origins of the first starter relay, when it blew it i had to replace the plug from the wiring harness because it was melted so badly. 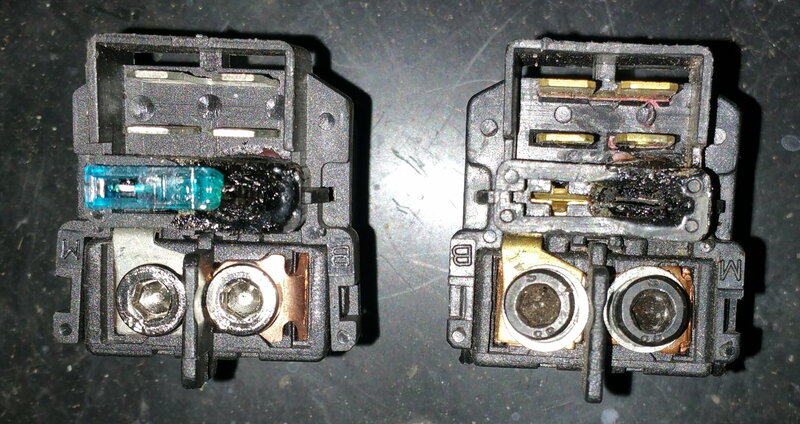 The 2nd starter relay was a cheapy from China (it came with the 15amp fuse, not sure why). My mechanic thought it might be the regulator/rectifier but did a voltage test while the bike was running and was getting between 13.7 and 14.5 (no higher). Note: Bike has been made into a stunt bike buy the previous owner with a few extra electronic bits... jet ski kill switch, speedo healer, fans on a switch. Last edited by donkeyf4i; 08-16-2018 at 07:55 AM. Check your cable resistances, starter draw, and grounding points on the battery cable. Resistance causes heat. Everything in the circuit can take more heat than that little spot. Starter Relays interchangeable between 01-03 and 04-06? High pitch noise, now keeps blowing starter fuse. Is this the correct subframe?